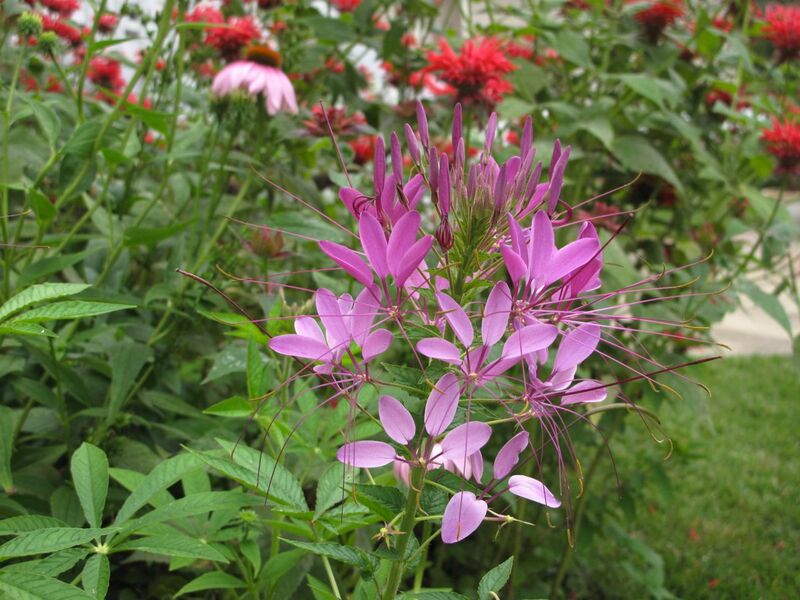 Cleome hassleriana (Spider Flower) is beginning to bloom profusely in several parts of the garden. This week temperatures are rising along with the humidity. Currently it is 85°F (heat index makes it feel like 91°F). The pattern throughout the day for the last few days and forecast for the rest of the week is this: clouds move in and eventually spill their rain, sun emerges and steams everything, then clouds move in again. Yesterday’s heavy rain turned the meditation circle into a pool for a brief time, but today’s mid-day shower was light and the sun quickly returned. Many birds are enjoying the feeders, but the American Goldfinches prefer to select their own food and so head for the swaying Verbena bonariensis (Tall Verbena) in the Western Border. Their beautiful yellow against the purple Verbena always delights me. Unfortunately the Goldfinches are too quick for my camera, but the color of Dahlia ‘Stargazer’ suggests a similar idea. The western border often looks unfulfilled so I have tried to enhance this area over the last few years. Many textures are too similar and plants need to be edited but this spot has been more exciting this year than usual. 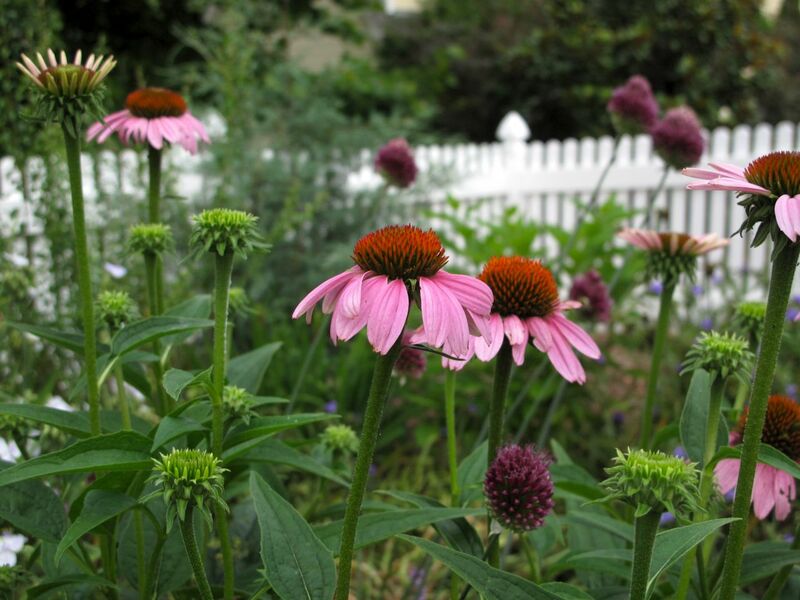 One successful pairing is the Allium ‘Drumstick’ the Echinacea purpurea (Purple Coneflower). Here are a few more details within the Western Border. Also in the western border my favorite Gladiolus bloomed recently. 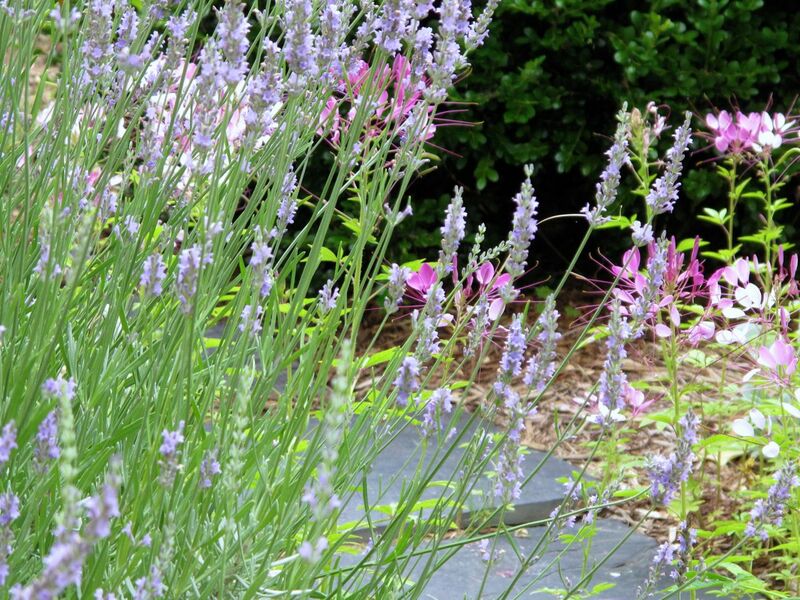 The buds are deep, deep purple, but the flowers open to a lighter hue. Lavender has been blooming for a couple of weeks now. 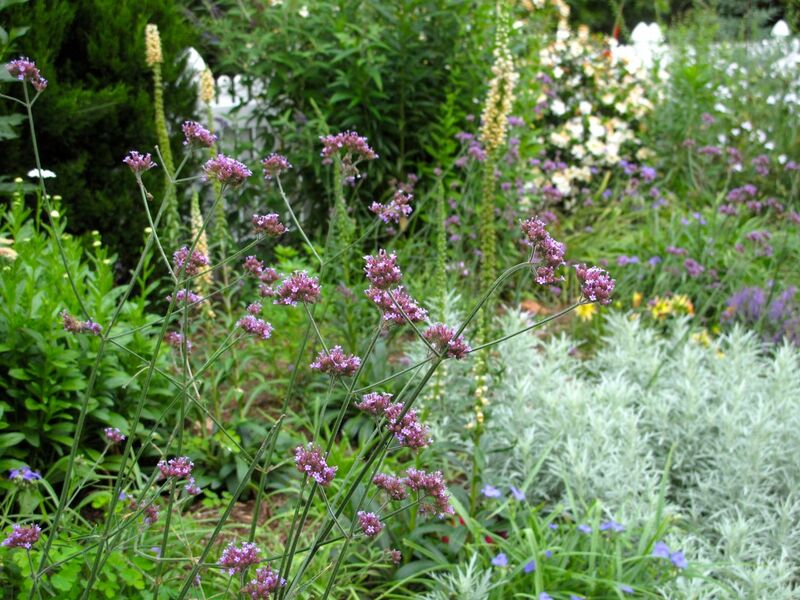 It is especially nice along the Southern Side garden. Cleome has self-seeded between the stones. At the end of the Southern Side path I encountered a busy hummingbird a couple of days ago enjoying the Lavender and Monarda. I gave up using hummingbird feeders years ago, but hummingbirds visit the garden often, this year more than ever. These fuzzy hummingbird pictures were fun to take—hope you can make him out. This entry was posted in garden and tagged almanac, garden photography, nature photography, summer garden on June 24, 2013 by pbmgarden. there aren’t any humming birds in Europe, I have seen them when I was in the States and they are as wonderful in reality as they were in the mind’s eye! I love the colour of the Hemerocallis. I never realized hummingbirds are limited to South and North America. They are exciting to see. That is one hot color on that daylily — a perfect way to illustrate the title of your post. I’m still waiting for my daylilies to open. Patience, I guess. Thank you. I also have a tangerine one that hasn’t opened. The garden does remind us about patience. Your garden is a little ahead of ours so it brings a smile to see your lovely gardens. We’re hot up here in NH also. Thank you. Glad to provide a little preview Judy! Thanks for the tour! I like that daylily, I’m still waiting for mine to bloom. The Drumstick Allium and the Echinacea are a great combination. Hope you’ll get to see a hummingbird one day. They are a real treat to watch. They’re very territorial. We have learned a few of the spots in the trees where they like to perch, but they don’t stay there long. Thanks Annette, I really like that red flower too. We had a long, cool spring that delayed and prolonged bloom times, but I think things are about on schedule now for summer. In the words of that old Van Morrison song, ‘This must be what Paradise is like.’ Just beautiful. Great song–I appreciate the reference! The garden really is my paradise. Really feeling like summer where you are then Donna! Thanks for checking out my garden. The goldfinches are in this area year-round, but recently increased their feeding activity among the flowers. Fun to watch, as are the hummingbirds–all amazing little creatures. I love that deep red hemerocallis with blue nepeta behind, a brave but pretty combo! Oh, thanks for trying to help me with the identification.You’re on for next year! Hope you’re all better. All too many of the color combinations in my garden result from what the plants decided to do. This is the Black and Blue Saliva and it spread itself all around in that border.